Planter fasciitis and heel pain is increasingly common these days as we walk on so many hard surfaces or, with the increase in participation sports. Start-up pain in the morning, which can increase over the course of the day, is typical for a heel pain or plantar fasciitis. This makes the normal walking or loading of the heel to toe movement of the foot becomes very difficult. This can be due to the hyperextension of the toes in the metatarsophalangeal joints which in turn gives rise to the tension of the plantar permanent loading and over straining of that planter ligament, fasciitis in its state of weakened tensile strength, leads to a continuous increase in neovascularisation bridging the longitudinal arch of the foot. In the case of an unsteady skeletal of the foot due to age (increasing from the age of 50), this passive process will increase with all foot deformities, such as a flat or a hollow foot in particular. Unsteady foot changes lead to an increase tractive stress on the three-layered planter ligament on the heel of the bone insertion. This results in microtears, failed repairing of the tissues with the generation of neovessels and accompanying increased pain fibres portions. And pain fibres, the full picture is of chronic plantar planter fasciitis and heel pain. There are other factors to consider such as increased weight, different ways in which people walk standing activities and reduced mobility in the ankle joint as well. The continuing inflammatory processes ultimate lead to reactions of the osteoblasts in the matrix, forming an apparent bony calcaneal in spur which is however responsible for the loading pain of the heel. How did it impact your life / sport / physical activity? It ruined my life completely even though I did the prescribed exercises. I seldom went out, spent a lot of time in bed, comfort ate, under exercised and gained weight. I began to use escalators and lifts instead of stairs and, sometimes after a relatively short spell on my feet in town had to take a taxi home as unable to weight bear. What other treatments did you try prior to Shockwave Therapy? Physiotherapy with prescribed exercises, acupuncture, insole from a podiatrist, new custom insole from hospital orthotics department, general massage and fascia release massage, prescribed pain killers, ice packs, hot soaks with Epsom salts. I also purchased various items suggested or advertised to relieve plantar fasciitis: special support socks, silicone toe separators, toe separating socks, special cooling bandage as pain relief designed to ice burns. 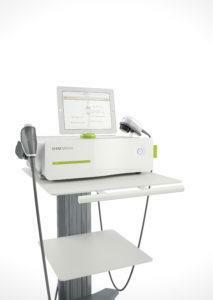 How did you find the Shockwave Therapy treatment ? Excellent, with a huge change after treatment one, about 80% pain reduction allowing me to be on my feet quicker and longer after rest. Each session improved by small increments but the huge improvement after session one opened up my life again. Prior to treatment, my foot and lower leg felt wooden, inflexible, the foot flopped as if no nerve messages were getting through to it. I felt I could not control the movement at all and there was this dead thing at the end of my leg. I walked as though I had had a stroke. 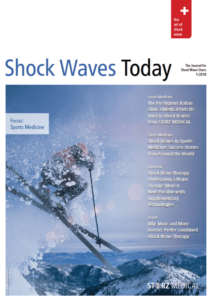 How many sessions of Shockwave Therapy did you have ? 4 Sessions of Focus Shockwave Therapy Helen takes about 50 minutes with chronic plantar fasciitis and heel pain That is because Helen finds it important to use the Vibrotherapy or V Actor which you can read about here. 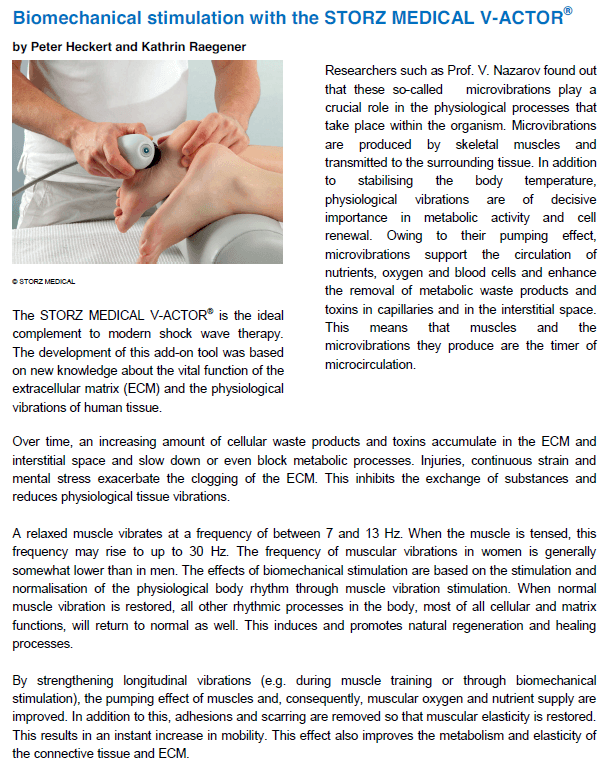 Using the V Actor enables the Focus and the Radial Shockwave Therapy to be effective. It reduces the tension in the plantar fascia as the plantar fascia bridges the arch of the foot. 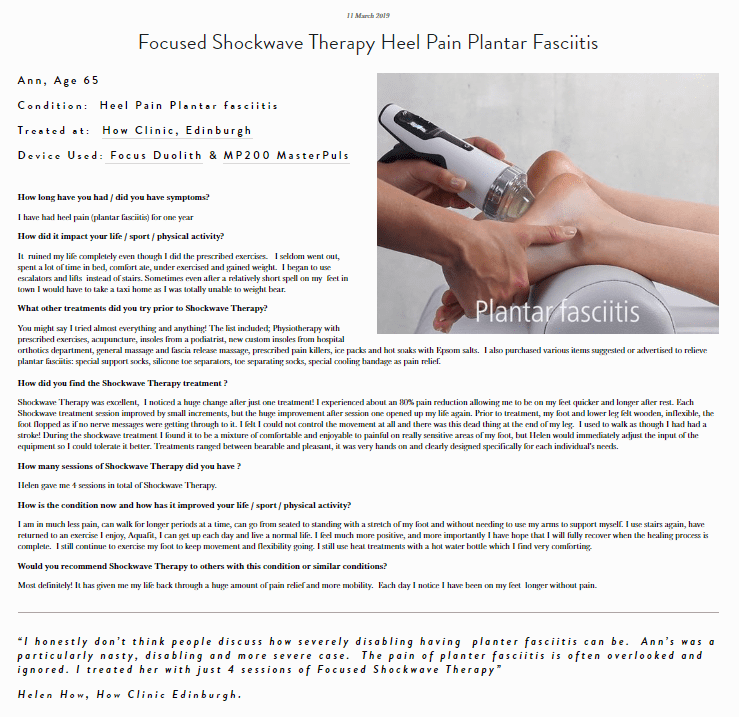 Helen finds it rather important to use the V actor on the severe disabling plantar fasciiitis which she has seen over the years. How was it during the Shockwave treatment? Some parts were very comfortable and I enjoyed, others painful on really sensitive areas of my foot, in which case Helen immediately adjusted the input of the equipment ranging between bearable and pleasant. It is hands on and designed specifically for each individual’s needs. How was it immediately after treatment ? 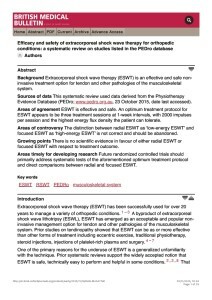 How long since your last session of Shockwave Therapy? How is the condition now and how has it improved your life / sport / physical activity? I am in much less pain, can walk for longer periods at a time, can go from seated to standing with a stretch of my foot and without needing to use my arms to support myself, I use stairs again, have returned to aquafit, get up each day and live a normal life, I feel much more positive, and, very importantly, I have hope that I will fully recover when the healing process is complete. I still continue to exercise my foot to keep movement and flexibility going, still use heat treatments with a hot water bottle which I find very comforting.